(VEN) - Viglacera Land recently received the Safe House Awards for its Thang Long Number One project and Mixed Use Awards for its Dang Xa new urban area project at the International Property Awards in the Asia-Pacific region. (VEN) - The Binh Dien Fertilizer Joint Stock Company with Buffalo Head brand is the leading manufacturer and trader of NPK fertilizer in the country which has achieved annual revenue of over US$350 million based on one main factory and four subsidiaries throughout the country. The company has been capable of producing and supplying 1.5 million tonnes of fertilizer products to the market, meeting 35 percent of the national fertilizer needs. (VEN) - Generali Vietnam Life Insurance Co., Ltd. recently announced the appointment of Chung Ba Phuong as the new Chief Executive Officer (CEO). Phuong took over from Simon Lam, who was responsible for building the Generali Group’s business in Vietnam and moved to take the position of Chief Executive Officer of Generali Insurance Thailand. (VEN) - In 2013, thanks to the efforts and unity of its leadership and employees, the Thac Ba Hydropower Joint Stock Company (Thac Ba Hydropower JSC) achieved an electricity output 106.9 percent of the year’s target. Referring to other norms, the company reached or exceeded the targets. These achievements paved the way for the company to improve capability and reach new developments. (VEN) - The Hoa Binh Construction & Real Estate Corporation (HBC) and Agrimeco recently won an about VND3 trillion package to build steel concrete and steel structures of the VietinBank Tower project invested by the Vietnam Joint Stock Commercial Bank for Industry and Trade (VietinBank). (VEN) - The global final round of the Cup Standard Chartered Futsal Championship 2014 took place at the Anfield stadium in the UK attracting 14 teams from Europe, Asia, Africa and the Middle East. (VEN) - All airports under the Airports Corporation of Vietnam (ACV) throughout the country implemented measures to ensure absolute safety and security and improve service quality during the holidays on the occasion of the Liberation Day (April 30) and the International Workers’ Day (May 1). (VEN) - For the last nearly 15 years operating in the form of a joint stock company (2000-2014), with the support of strong shareholders such as the PetroVietnam Oil Corporation (PV Oil) and the Saigon Petro Co., Ltd, the Thu Duc Trading and Import Export Joint Stock Company (Timexco) has achieved remarkable results. 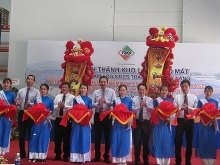 (VEN) - Maintaining market share and ensuring sustainable development and effective operations remained main objectives of PV Oil Tay Ninh in 2013, creating favorable conditions to affirm the company’s prestige. To achieve main objectives, expanding distribution network played a key role. (VEN) - The Saigon Beer Alcohol Beverage Joint Stock Corporation (SABECO) has undergone a 139-year history and for the last 37 years, it has made great efforts to build and develop its brand which has become a pride of Vietnam.